The day began too well. Our beds were so comfortable at Casa Usategieta that we didn’t want to get up. I missed some sleep with a rough throat and a possible ear infection but we were both well rested. After a delightful breakfast, we said goodbye to Guy, Mirabel and Jesus and started off around 8:45am. After only a short distance into today’s walk, we spy the peak that we will round, just right of center of the photo. We will only climb to the part just to the left of where it gets vertical. It was a simple and gentle climb for the first four or five kilometres but then the real climb started for today. It was only about 300m up but at a fairly steep angle. At one section, we were almost scrambling up loose rocks at at least a 30 degree angle but after 1.5km, the climbing was done for the day and we were rewarded with a great view back to Cabredo and Genevilla, where we started today. On one side of the mountain pass, we could see all the way back to Genevilla where we started the day. Melanie wondered why the Spanish government wasted so much money and electricity running these giant fans all the time as it was super windy in the area anyway. She’s so cute. 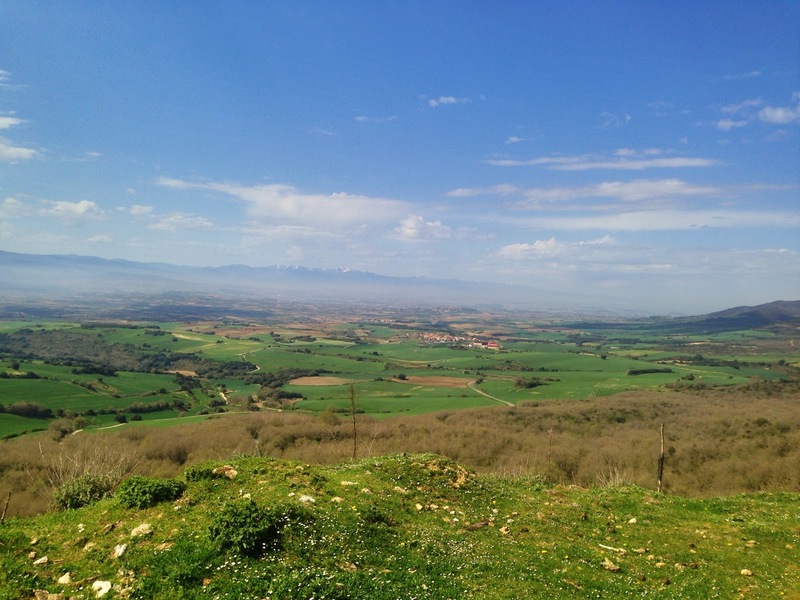 As we rounded the peak towards the town of Laplobación, we were rewarded again with an even more stunning view of the entire valley to the south. 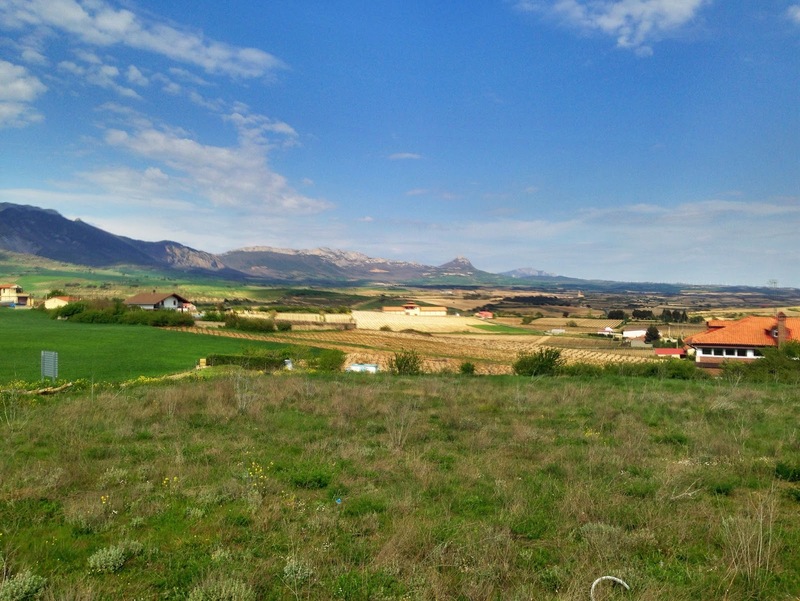 Not only could we see today’s destination of Laguardia but we could see tomorrow’s (Navarrete), the next day’s (Logroño) and the snow-capped peaks of the next mountain range. It was at this point though that our fate became a little twisted. On this wind sweated hilltop, our GPS program stopped working. It could no longer tell us if we were on the right route. 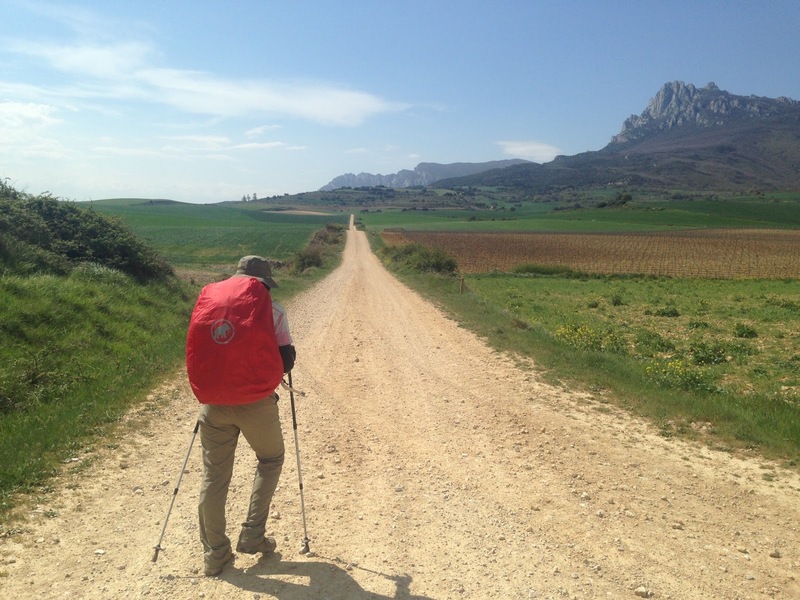 No matter how far we walked, it was stuck showing us in the little village of Laplobación. 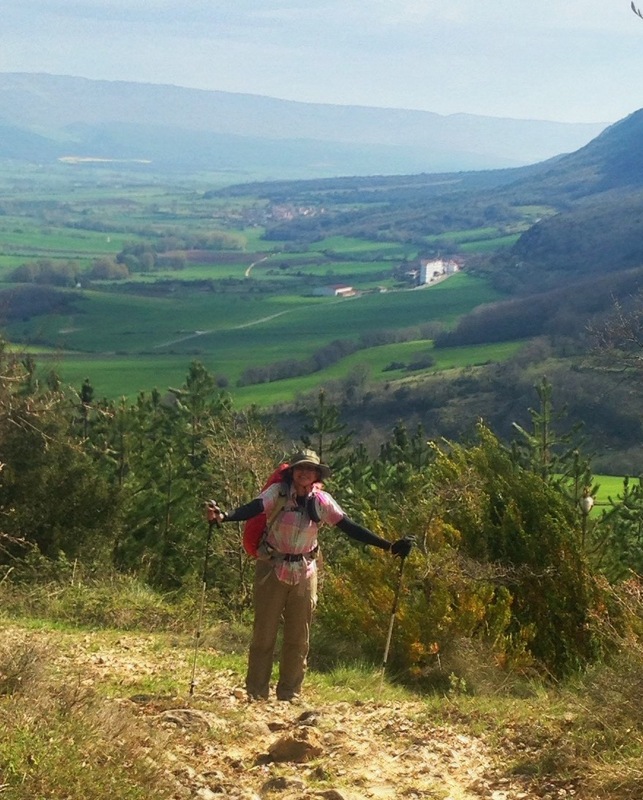 We moved to Plan B – searching for orange arrows and reading the route description on the camino’s webpage. 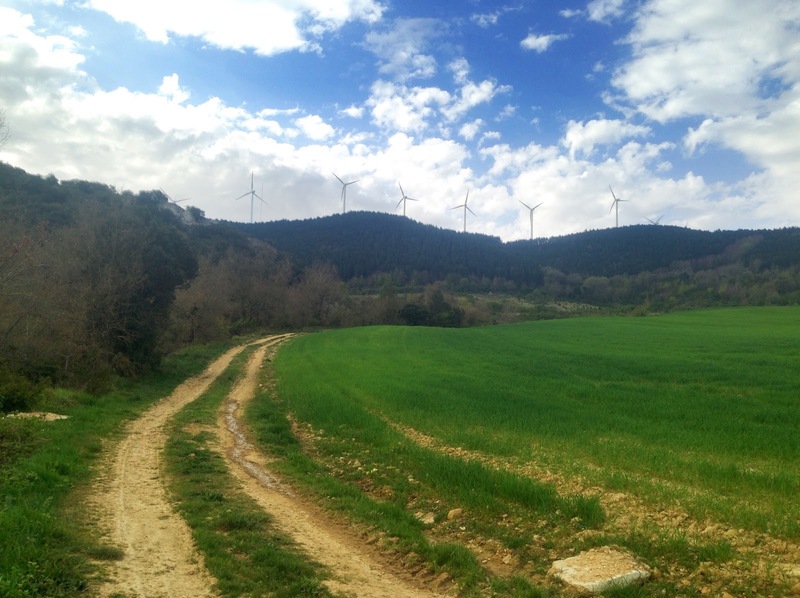 This got really challenging in the town of Meano but a local resident helped set us on the right path and the arrows soon reappeared – just not soon enough. I was still trying to look at the paper map and written directions while walking, trying to confirm the man’s instructions. Multitasking was never my strong suit. I stepped on the edge of a pot hole and rolled sideways on my now twisted ankle. Instant pain in the ankle, calf and knee scared the heck out of me but I could still walk on it. Fortunately, the ankle was strong after the last few days and it also happened after about 11km today so my muscles, tendons, ligaments, etc. were all nicely warmed up and stretched. The lower leg is just sore now but not too bad. After hugging the base of the mountains for another five kilometres through a nice dirt road, we got to the town of Kripán. By the way, don’t write that as Cripan unless you want to get into a fight with the Basque people. Anyway, we hoped to get something to eat there as well as fill our water bottles but we couldn’t find a single person. I left Melanie resting at the town hall and searched for anyone with a heartbeat. Eventually, I found someone who confirmed that there was no restaurant but suggested that the town bar might be open and might have some food. Here’s where we met the twisted bar man. The bar with no name and no customers was surprisingly open. Unfortunately, they do not serve food but they did have bags of potato chips (crisps for my British friends) and ice cream for sale. Seeing our dejected looks, the bar man offered to cook up some local eggs and churrizo that he had in the back room. He was a saviour but an expensive one at that. Four fried eggs, two short lengths of churrizo, some bread, a coffee and a beer came up to 20€. I looked shocked when he said the price but he just shrugged his shoulders which is Basque for “you should have asked the price before I made you lunch”. A lesson learned. After leaving the village satiated but poorer, we had a little bit of brushland to walk through until we hit the Spanish version of Stonehenge. I’m doubting they get as many visitors to this “prehistoric” dolmen though as it looks a lot like a few guys were drinking heavily during a camping trip and they came up with a great idea. I can almost hear them when they idea sprouted… “Hey, the ground is really cold. Let’s roll these rocks over there into a circle so we can sit on them and have a campfire in the middle. Oh boy. A new twisted history. The last 8km to Laguardia is all paved road or dirt track, mostly through vineyards. It made the 27km not too bad but we still arrived in town after 5:00pm. It took a bit of time to find a hotel as the first one we looked at was in the old castle and looked too fancy. The second one we checked out had rooms only in the 175€ range. I don’t think they even included breakfast at that. Finally, we were directed to the Hostal Biazteri who had one more room with bathroom attached but it was on the third floor of the walk-up and it was 55€, including breakfast (after 9:00am). The room is doing what it was supposed to though so we can’t complain too much. Upon entering Laguardia, we could look back and see the mountain pass that we crossed. The peak in the center was the near side of the peak where the photo of Melanie above was taken on the other side. 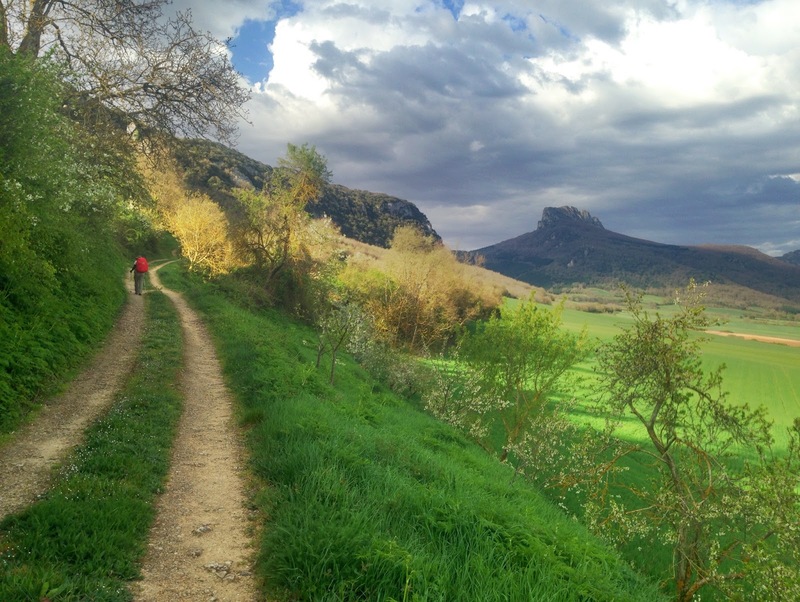 For those following us: Kripán is in a really good spot for a restaurant on this Camino. Sadly there is no restaurant and one bar that doesn’t normally serve food. If you ask nicely though, the bar man will make you something but remember, ask the price first. To get to it, go straight past the town hall about 100 meters, rather than turning right next to the church. Next to the pelota court, look up to your right and you will see a Heineken sign over a door. That’s the bar but that door is always locked. Enter by the door facing the swimming pool. Just don’t tell the bar man that I sent you. Michael, Great post, and a great effort to make it to Laguardia. That is not an easy day's walk. Congrats to you and Melanie. I am also pleased to note your sense of humor remains intact. I always wind up smiling as I read your posts. Buen camino.